Michael Chabon wrote one of the smartest explorations of superheroes in his Pulitzer-winning The Adventures of Kavalier and Clay, so it was exciting news when he agreed to write the script for Spider-Man 2. Unfortunately, some studio execs, in their wisdom, decided to bring in some other writers, including Smallville co-creators Al Gough and Miles Millar, to revamp Chabon's script. Now David Eggers' literary magazine McSweeney's has put Chabon's original version online, as a free PDF, for a limited time. We compared Chabon's draft with what ended up on screen. And not surprisingly, everything that was good about Spider-Man 2 is in the Chabon version, and a whole lot more besides. The biggest difference in Chabon's draft is the character of Doctor Octopus, who's much more complex and rich, with moments of great urbanity. Otto doesn't have a wife who dies as a result of his octopus-arms experiment going awry. Instead, he's single and actually courts Peter's would-be girlfriend Mary-Jane, with a great deal of success. There's a great scene where they go to dinner at an Ethiopian restaurant. Says Octopus, "I like to eat with my hands." He also tells her,"I'm a little freaky." There's also a running subplot where Harry Osborn, Peter's roommate and the son of the Green Goblin, has put extreme security measures in place in their apartment, including steel bars and retinal scanners, among other things. Harry is having weird nightmares about his dead father, and he takes out a $10 million bounty on Spider-man's head, with the help of the Daily Bugle. Spider-Man keeps almost getting killed by ordinary people whom he's trying to help, because they want a chance at that money. Remember that whole sequence in the movie where Peter decides he's sick of being Spider-Man, and then loses his powers for no particular reason? And he suddenly needs glasses again? And it's never explained, but then he randomly gets his powers back when he needs them most? In Chabon's draft, it actually makes sense. He talks to Otto Octavius, who gives him a special "pacer chip" that will reverse his spider-encoding DNA. Because Otto worked on the super-spider project that led to Peter getting his powers, he has the ability to reverse them. So Peter injects himself with the chip, and slowly loses his powers. By the end of the film, he's totally powerless and having to improvise using a truck and some "webbing" made out of orange fencing when he fights Dr. Octopus. Instead of Dr. Octopus going berserk and robbing a bank, he finally loses it when he's on a date with Mary Jane. He decides to wear his cybernetic arms on the date, because of the "endorphin push" he gets from them. (The script talks a lot about the "endorphin push" and how it counteracts Otto's pain, to the point where it becomes super-creepy.) And while on the date, Otto uses his cyber-arms to beat up a couple of guys who hassle him and Mary Jane, to her horror. 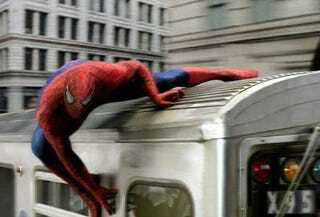 Dr. Octopus doesn't become permanently fused to his exo-arms until a bit after that, when he and Spider-Man have their subway-train fight and Spider-Man is trying to disable the arms. And the reason why Dr. Octopus wants to capture Spider-Man is not just to please Harry Osborn, but also because that "pacer chip" that took away Spider-Man's powers will also help stabilize his fusion with the bionic limbs, which is killing him. The sequence where he makes an alliance with Harry over Spider-Man's prospective dead body makes a lot more sense in Chabon's draft. The business with Aunt May finding out that Peter could have stopped the thief that killed Uncle Ben and becoming angry is much more intense and moving in Chabon's draft. And then later in the movie, she and Peter have an incredibly poignant scene together where she tells him that feeling crushed by your responsibilities is just normal life, for everybody. It's not something you can escape, and it's not a special destiny. It's just life. And instead of Spider-Man getting his powers back as mysteriously as he loses them, he gets them back by using a knife and some pliers to dig the "pacer chip" out of his arm. It's a gross but extremely effective scene. And in the end, Dr. Octopus manages to capture Spider-Man and straps him to his nasty spine-extracting machine. And that's when Harry and Mary Jane both learn Spider-Man's true identity. And it's Mary Jane who gets through to Dr. Octopus, thanks to the connection that the two of them forged earlier in the movie, and convinces him to abandon his experiment. Then Spider-Man breaks free and saves her from Otto's collapsing laboratory building. All in all, it's much more coherent and effective than the somewhat jumbled version we saw on screen, not surprisingly. Get it while you can! Update: McSweeney's has already taken the PDF down, after just a couple of days of being online. But I would be shocked if you had any trouble tracking down a copy.